Artist Lisa Price grew up in the Chicago suburbs and spent her childhood summers gardening, canning, and visiting the farmers market with her grandmother in northern Indiana. That is where she began her fascination with nature and the colors and designs of the fifties. She has fond memories of spending countless hours playing with her grandma’s vintage fabrics, this is where she learned to sew. Trips to the farmers market led to tons of old school kitchen time, canning, and baking pies. Every morning she helped her grandma water and maintain the garden plants, talk to the birds, and feed the chipmunks. Her creativity, style, and ideals truly make sense in the context of her life and filter through into artgoodies products. After losing her job twice in 2005 Lisa set out to live a more meaningful and thought provoking life. She created artgoodies in 2006. She uses her B.F.A. in printmaking to bring you modern housewares with vintage flair. Each of her products are hand printed with one of her original designs. 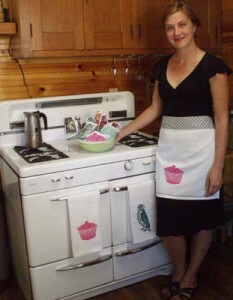 Plus her aprons and many of her pillows are sewn together with vintage fabrics. 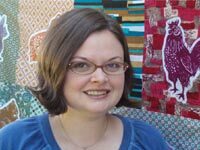 Lisa resides in Grand Rapids, Michigan where she works out of her home studio. For wholesale inquiries please email-lisa@artgoodiesonline.com. Please include your store: name, address, website, resale tax id, and contact name.